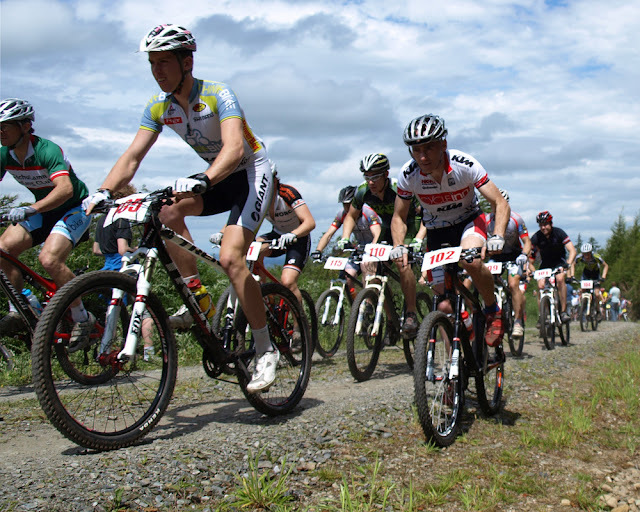 Very enjoyable race on Sunday - despite all that mother nature could throw at them, for the second year running IMBRC came up trumps with a great course and event in general. I had no goals for this race as I'd been putting in some pretty dismal performances to date in the NPS. All I wanted was to put in as strong an effort as I could and just play it by ear after that. Got the pre-ride of the lap done early and back to the car for some chill out time before a good warm up. It was the first time with the new bike so was a little nervous especially with the newly tubless tyres and also the headset, but everything held together nicely so was happy enough. Well until I was heading down to the start of the race when I noticed the front wheel deflating again... Luckily Conor had his hand pump with him so a minute or two of blasting it seem to do the trick. Once the race started no one was full on sprinting up the fire road (well apart from Gareth Mckee), so it gave me time to think (bad idea) maybe I should blast off meself, but in the end I decided to hold off as it was a long climb up to the entrance of the single track. So I was happy to get in there in the middle of the pack, though in hindsight, blasting it up might have been the better option as a few of the guys ahead of me were struggling through the first half of Rabbit ride. I tried to pass a few in the singletrack but nothing stuck (ended up smacking a tree after a tussle with Matt Slattery - totally my fault). Those mistakes just made me want to push harder which in turn led to more mistakes. On lap 2 I took a nasty tumble on the rooty stuff in Rabbit Ride which cost me a couple of places. The air was blue around me after that one, but a little further on I found Oisin on the deck, so it was encouraging to see that everyone was having problems (sorry Oisin!). And that was the pattern for the majority of the race. I'd pass guys, then crash/dab, they'd pass me, then I'd pass them again. At one point near the start of Rabbit Ride, I tried to pass someone on one of the steep climbs, choosing to ignore the wet roots crossing my path. So I hit the roots, and get sent off the trail. I was really pissed at this stage, so just pure anger kept me spinning the pedals and I managed to cycle over a tree stump and back on course cursing and spitting as I went - not sure that Evan Ryan made of it all as he was sitting right behind me. :) I did manage to make up on most of the mistakes by pushing hard on the fireroad sections and the last piece of singletrack before the start/finish line, but I'd love to have gotten one clean run through the course to see what kind of lap time I could have managed. After a bit of confusion it turned out that I'd came 4th in the race, which was surprising as I did think there were a few more riders ahead. I was nice to get a decent result finally (think it equals my best ever XC race finish) but there were plenty of better riders not out racing on the day and some of the guys who were out seemed to be not firing on all cylinders. But all you can do is race who's around you. I felt pretty good through out the race. I was worried about not getting enough fluid and energy during the race, but I kept downing a high5 gel in per lap and drinking as much fluid as possible, so no cramping for any of the race which was great. 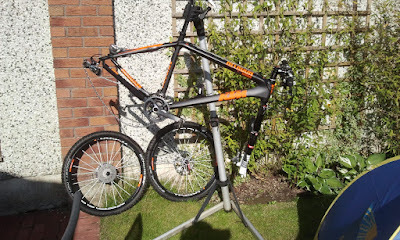 My new bike - KTM Prestige XTR-2 is just a dream machine - simple as. Without doubt the best bike I've ever ridden. 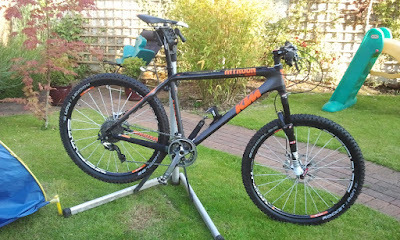 Its super light (weighs less than the road bike I do the occasional race on! ), the DT Swiss XRC100 carbon fork is amazing - very plush straight out of the box and very bling :) and the Tricon wheels are both super light and easy to get a tubless tyre onto (a regular bugbear of mine). Finished off with the 2X10 XTR drive train, its the XC hardtail race bike. Again, IMBRC did an awesome job running another cracking race and its great to see all the other competitors on the day feeling the same way. Also big thanks to Aine for bottling duties and photography and too all the other photographers out on the day. Looking forward to seeing the video! Next up is the National Champs in Killruddery. Should be an interesting one, but I'm not expecting much results-wise. But like the Slade race I will give it 100% on the day and see where that gets me.